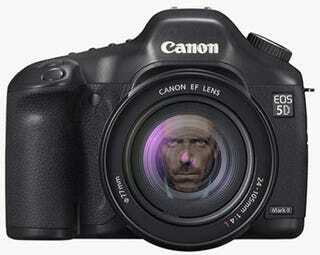 Wow, the House (great show, btw) season finale was shot entirely on a Canon 5D Mark II. You think that the HD video quality of dSLRs is challenging pro video and film gear yet? House director Greg Yaitanes announced the news on Twitter, then he preceded to take technical questions from the audience. Apparently the 5D was a perfect fit for the "tight spaces" of the finale. They used Canon prime lenses along with the 24-70 and 70-200 zoom and, believe it or not, they didn't use an image stabilization rig of any sort for the non-tripod shots.